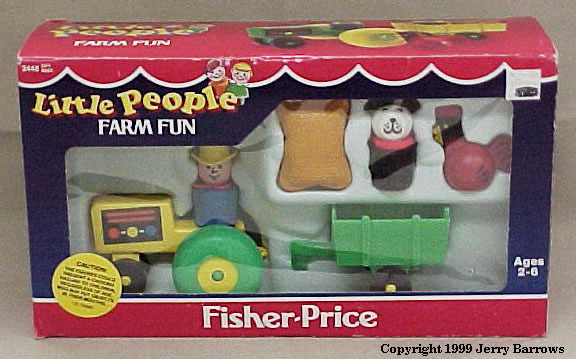 Description: This set replaced 1983-1984's #636 Farm Fun. In addition to having a tractor, cart, farmer, dog, and rooster, this set also includes a plastic simulated burlap feed bag. FPT464 - Green tractor with yellow wheels. Has a litho on the engine that has a black background, 3 dots (red, yellow, and blue), and 2 red lines above the dots. Front 2 wheels held on via GREEN plastic rivets and the wheels are NOT marked. FPT912 - Rectangular tan plastic simulated "burlap" feed bag/sack. The feedbag has 2 rectangular pieces molded together in the middle, having a seam on all 4 edges of the feed bag. The feed bag is squeezable. Overall size: 2-1/4" long x 1-1/2" wide x 3/4" thick. JEPP - Tall blue farmer with a yellow cowboy hat and a yellow non-triangular scarf. *See Variations below. ANPP - Tall blue farmer with a yellow cowboy hat and an orange non-triangular scarf. FPT484 - Green cart with Yellow plastic axles, wheels NOT marked. FPT483 - Green cart with Yellow plastic axles, wheels marked "Fisher-Price Toys".